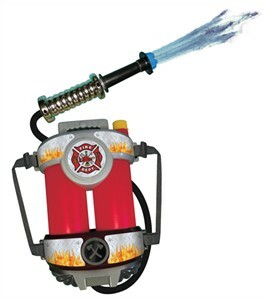 This Super Soaking Toy Fire Hose brings a whole new kind of water fun! Your child will make a splash in his or her firefighter costume when toting this powerful fire house that's sure to complete the outfit. This toy fire hose might not be suitable for putting out real house fires, but it's got enough super soaking power to satisfy any water-lover, especially when it's hot out. Plus, with a backpack that holds lots of water, your little firefighter won't have to reload for a long time, which means extra fun! Availability: This Super Soaking Fire Hose takes approximately 1 business day to leave the warehouse plus transit time.